Several of the best known Minnesänger are also noted for their epic poetry, among them Heinrich von Veldeke, Wolfram von Eschenbach and Hartmann von Aue. 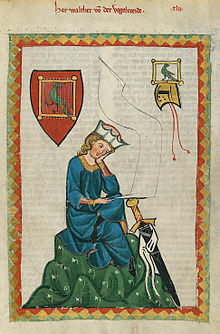 The earliest texts date from perhaps 1150, and the earliest named Minnesänger are Der von Kürenberg and Dietmar von Aist, clearly writing in a native German tradition in the third quarter of the 12th century. This is referred to as the Danubian tradition. From around 1170, German lyric poets came under the influence of the Provençal troubadours and the French trouvères. This is most obvious in the adoption of the strophic form of the canzone, at its most basic a seven-line strophe with the rhyme scheme ab|ab|cxc, and a musical AAB structure, but capable of many variations. A number of songs from this period match trouvère originals exactly in form, indicating that the German text could have been sung to an originally French tune, which is especially likely where there are significant commonalities of content. Such songs are termed contrafacta. For example, Friedrich von Hausen's "Ich denke underwilen" is regarded as a contrafactum of Guiot de Provins's "Ma joie premeraine". Only a small number of Minnelied melodies have survived to the present day, mainly in manuscripts dating from the 15th century or later, which may present the songs in a form other than the original one. Additionally, it is often rather difficult to interpret the musical notation used to write them down. Although the contour of the melody can usually be made out, the rhythm of the song is frequently hard to fathom. There are a number of recordings of Minnesang using the original melodies, as well as Rock groups such as Ougenweide performing songs with modern instruments. In the 15th century, Minnesang developed into and gave way to the tradition of the Meistersänger. The two traditions are quite different, however; Minnesänger were mainly aristocrats, while Meistersänger usually were commoners. At least two operas have been written about the Minnesang tradition: Richard Wagner's Tannhäuser and Richard Strauss' Guntram. The following love poem, of unknown authorship, is found in a Latin codex of the 12th century from the Tegernsee Abbey. dû muost immer drinne sîn! des(sen) sollst du gewiss sein. du musst immer darin sein! Thereof you may be certain. And you must ever be therein! H. Moser, H. Tervooren, Des Minnesangs Frühling. Carl v. Kraus, G. Kornrumpf, Deutsche Liederdichter des 13. Jahrhunderts (Niemeyer 1978) ISBN 3-484-10284-5. There are separate editions of Walther's works, and of a number of the most prolific Minnesänger. There are many published selections with Modern German translation. Wikisource has the text of the 1911 Encyclopædia Britannica article Minnesingers. "Minnesinger" . New International Encyclopedia. 1905. "Minnesinger" . The New Student's Reference Work . 1914. "Minnesingers" . Collier's New Encyclopedia. 1921.